Taiyin Xisheng has 36 melodies in five folios, all with lyrics.3 Its publication date of 1625 is based on the dates of its various prefaces. It was not indexed in Zha Fuxi's Guide: presumably he did not see a copy as by the 1950s it was very rare, only three copies having survived. They apparently are not all identical.4 The one used here was a copy now in the Music Research Bureau, Beijing. 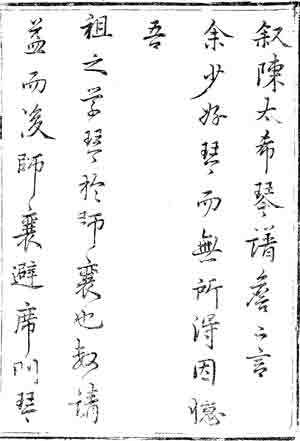 Being himself quite poor, during the 1620s when he was in Beijing he obtained the help of Kong Yinzhi10 and others in getting it published. There is considerably more commentary in the Qinqu Jicheng article, which eventually should be translated in its entirety. Legge (ctext.org): "Loud is its sound, but never word it said; A semblance great, the shadow of a shade." Waley: "Great music has the faintest notes; The Great Form is without shape". D.C. Lau: "The great note is rarified in sound; the great image has no shape." The phrase written as "太音希聲 taiyin xisheng" appears in Section 4 of the lyrics/text for Jingye Tan Xuan (shortly after "大象無形 daxiang wuxing"). "希聲 Xisheng" is also suggestive of the nickname for the compiler of the earliest surviving qin handbook to pair lyrics to all its music, Zheyin Shizi Qinpu, compiled by Xi Xian, the "Beyond Sounds Immortal". That this handbook was not indexed in Zha Fuxi's Guide makes it more difficult to trace melodies. It also suggests that although the commentary in front is attributed to Zha Fuxi, it was revised later, presumably by Wu Zhao. This image is copied from QQJC IX/101 (see more). I do not know the reason for this. 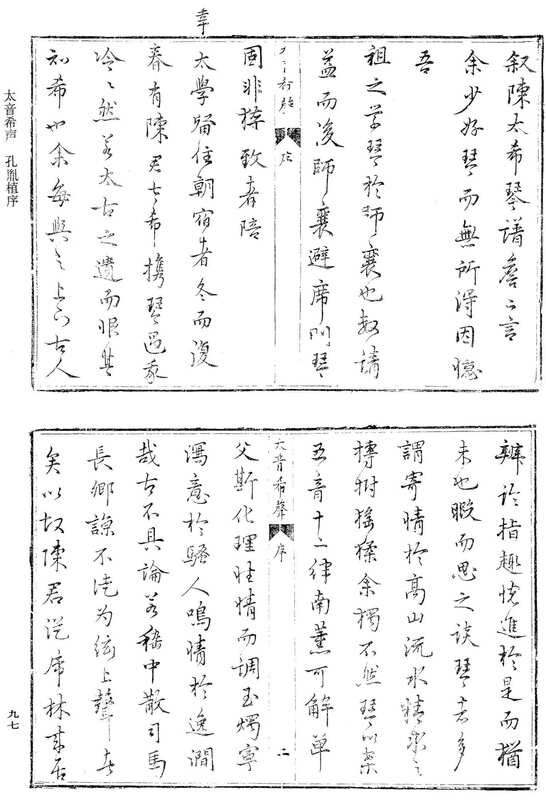 The Qinqu Jicheng preface to Taiyin Xisheng says that of the three known surviving editions the one included in QQJC is one of two kept in the 中國藝術研究院音樂研究所 Music Research Bureau, Beijing; the third is kept by the 浙江省衢縣文管會 Zhejiang Province Qu County Committee for the Management of Cultural and Historical Relics. Qu County (衢縣 Quxian), now usually Qu District (衢州 Quzhou), is about 200 km southwest of Hangzhou. My preliminary examination of the version in Qinqu Jicheng suggests it has many copy errors. This may be uneven and resulting from different people actually doing the copying, or uneven proof-reading. It may also be some of the errors could be clarified by studying the different surviving copies. There is some further discussion of errors under the one piece from this handbook I have studied in some detail, Se Kong Jue. 龍游徐南山 . See Xu Shiqi.